I always love the room decorations completed by eastern antique figures and art pieces. While they add sophistication by their characters, they express gratitude of life. Therefore, to me they are the best complements of living spaces by their poistive energy and that explains why they help to add sensation where they stand. I think the smart combination of urban simplicity and gorgeous chinese antiques in this room set up are perfectly balanced the way they are placed and layered .The large door opening to the dining room works as a center point. The oversize sculptures and antique fabrics in brass frames nicely adds depth to this livingroom. While white and dusty hues provides a tranquil palette, they help antiques to pomp out in style. The cotton upholstery fabric with stripes on a single armchair is modern and comfortable. 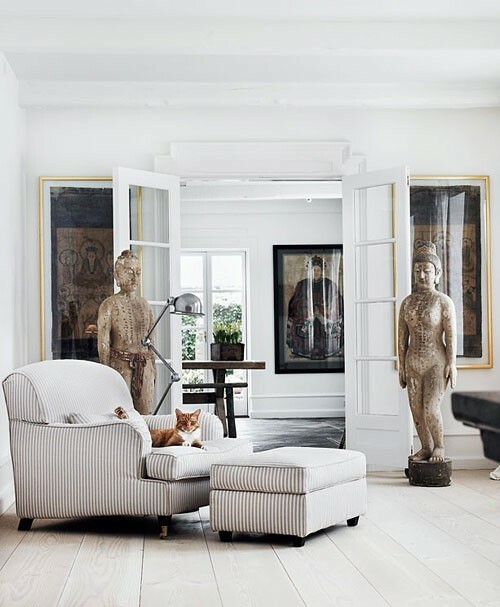 Bringing these aesthetic elements are welcoming the sensational quality to the room and this cat absolutely know where to sit to relax!! !